CELL joins twenty-two allied organizations – including environmental organizations, legal experts, social justice and community groups – in calling on the provincial government to introduce a series of bold reforms in its upcoming overhaul of BC’s environmental assessment (EA) regime. The groups, who welcome BC’s commitment to EA revitalization, presented BC Environment Minister George Heyman with their “vision for next-generation environmental assessment in British Columbia,” which lists 14 requirements for an assessment law that will build public trust, and advance reconciliation and sustainability. The vision set out by the groups outlines the potential of a next-generation EA law that establishes sustainability as a core purpose and outcome, recognizes Indigenous decision-making authority, ensures that BC meets its climate targets, and addresses “big picture” issues – such as managing the cumulative effects of development in a region. 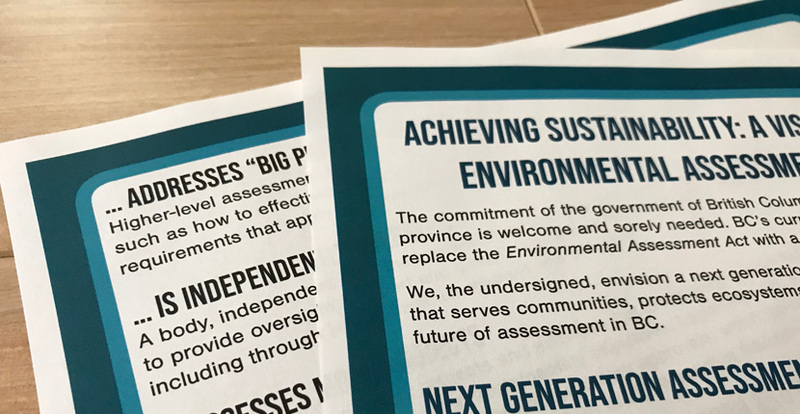 The organizations also say assessments must be led by an independent body, involve the public, and require decision-makers to demonstrate that their decisions are based on science and Indigenous knowledge. A recent report from West Coast Environmental Law, Why It’s Time to Reform Environmental Assessment in British Columbia, highlights a number of these voices and concerns. BC launched its process to review the provincial EA regime in March 2018 and is expected to release a discussion paper on EA revitalization soon.